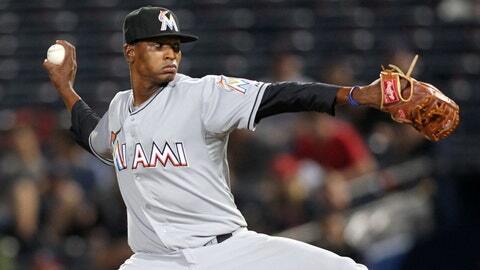 During his minor-league career, Miami Marlins pitcher Jose Urena has started 104 of his 123 games. ATLANTA — Miami Marlins top prospect Jose Urena made his major-league debut on Tuesday night against the Atlanta Braves, tossing a scoreless ninth inning in an 8-2 victory. Urena, whom the Marlins called up on Monday with righty David Phelps on the paternity list, ranged from 85-94 mph on his pitches. "I felt fine," Urena said. "Yesterday I was a little nervous, but today I was fine and confident." The 23-year-old righty fielded Kelly Johnson’s slow roller down the third-base line on the barehand and induced Andrelton Simmons’ flyout to center. Pinch-hitter Johnny Gomes singled to left on a liner before Eric Young Jr. grounded out to second to end the ballgame. Of his 18 pitches, 11 went for strikes. During his minor-league career, Urena has started 104 of his 123 games. With Phelps due to join the ballclub in New York for the Mets series, Urena will likely head back down to Triple-A New Orleans as the corresponding move. "It’s different because when you’re in the bullpen you’ve got to get ready all the time because you don’t know when they’ll call you to be out there," Urena said. "You’ve got to be fast. The starting pitcher you have to take your time when you go out there every five days." Added manager Mike Redmond: "It was a perfect situation to get him in there. Anytime you can get a young player in there in not a high-leverage situation is good. It was great to see him get in there. I think he really enjoyed it. It was fun for us to watch."